Lost two phones in one day. Well, “lost” is a relative term. I was carrying two, one, a Nokia Lumina 1020, for its camera and for what a phone used to be used for. It had my Cricket SIM card. The other, my Nokia 520, for music, since it had a slot for a memory chip, which I appreciated since the 1020 was getting a bit full. To be fair, the 1020 was having problems–“issues,” as we would say where I work–already. Bluetooth wasn’t working. I couldn’t connect it to my Band, had to use the 520 for that, and that works only where there’s wifi connection since the 520 doesn’t have a SIM, and apparently the band needs Bluetooth and internet to connect. Partly to see if it would make Bluetooth come back, and also because I was impatient, I put the 1020 on the Windows 10 mobile fast ring and got that installed. But that didn’t improve things, and in fact made things worse, I don’t remember exactly how. My wife complained my phone went straight to voicemail (at least it went to voicemail) but that may just have been my inattention. So I set the 1020 aside, took out the SIM card, and opened the 520. It had Windows 10 build whatever on it, and was a bit sluggish, as likely from being underpowered as from the beta software. But I screwed up the SIM transfer and broke some of the connectors on the SIM card carrier trying to fix it. So now the 520 works fine, game, email, internet, music, just not as a phone. I tried to fix the 1020 by rolling back its software, various things, I forget all the details, but including using the Nokia Windows Phone recovery tool. In short, that didn’t work. It seemed to, allowing me to restore a saved image and all, but when I got done the phone function didn’t work. I know a phone’s supposed to be a phone, and even though to me the 1020 was more a camera and a screen for Facebook and Netflix and a game machine (Pegs and Holes an obsession), I wanted to fix it, if I could. I trolled around on the internet, found a similar problem from another phone user (on a 920 I think) that suggested an antenna might be loose (and I thought, that might explain the Bluetooth problem also) and easy to snap back together. I’m not much with a screwdriver (worse with a soldering iron). I tend to break things when I take them apart. But I thought I’d try. I went to Home Depot to get some Torx screwdrivers for those tiny star headed screws that hold these phones together, found some disassembly instructions on the internet, and took the thing more apart than I felt safe with. Of course, as it turned out, that little adventure didn’t lead anywhere, and now the Nokia Recovery tool has trouble finding the phone at all. So next I tried to fix the 520. I love that phone, its size and its price. And its expandable storage. And you can still get them. 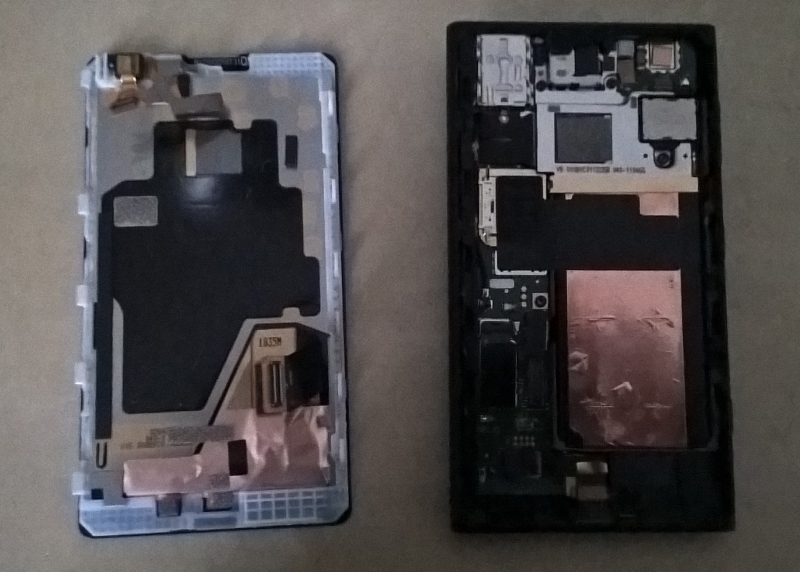 But it was my working machine (not phone without the SIM), and I felt reluctant to take it apart. What had happened to it was that I got a SIM card adapter jammed into the slot (the 520 takes a micro SIM, and my SIM from Cricket is a nano SIM–makes me think of coffee sizes at Starbucks–and I was careless). It took work to get it out, and it didn’t come out safely. So there I was, phoneless in fact. Attentive reader of this blog will remember I had a Nokia 920 also, but that phone’s in use by another member of my small family now. 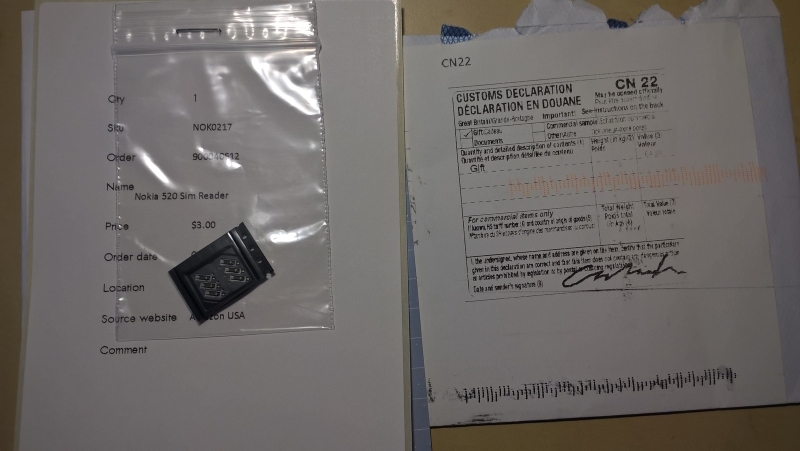 I did, eventually, order a part to replace the broken SIM carrier on the 520 (it was $2.99, including shipping from England in an envelope with a Customs declaration on it) but I fear it will require soldering, another chance to fumble. Part for the 520, not much bigger than a dime. Give me bad code to fix any day. I got the 520 as an AT&T Go Phone, from the Radio Shack on the corner before it became a Sprint house. I decided to replace it–my backup phone I called it–with a Lumia 640 Go Phone, this time ordered from the Microsoft Store. I think I paid about the same in both cases, around $80. Still I knew it wouldn’t have the camera the 1020 had, not even close, so I thought I’d at least look at the used phones on Amazon. I took the risk on an unlocked 1020 priced a bit under $200, kind of a bargain. I was phoneless for a weekend, then both phones arrived on Tuesday. Inventory: So now I have a working 1020, a dead 1020, a 640, and a 520 which sort of works and runs the latest beta build of Window 10 mobile. I also have a Moto-E, but I’m not sure that’s actually a phone. Posted in Life, Windows Phone. Now the Xbox is gone, replaced on my desk by a Raspberry Pi, another mystery. But this is two stories, not really related. The Xbox went, after 15 months, to my grandson in Seattle, though shipping it up there felt a bit like an old cliché. After Build 2014 I tried to accept the Xbox into my life. I liked the (idea of the) Kinect, and the fact that it seemed to recognize me (though there was no other user to compare). I did have trouble getting over the fact that I had to pay extra for some things (an Xbox Live subscription to watch Netflix, which could already watch on my computers or my Rokus) but the terms changed and I tried it out. Using a controller instead of touch or a keyboard and mouse took some getting used to. In short, the Xbox worked, but it took up space, and I didn’t see the value in it, except for the Kinect, which I liked more in the idea than the application. So I thought I should try using the Xbox for its original purpose so around Christmas time I bought a couple of games at a Microsoft sale, Forza and Call of Duty: Ghosts. That’s what I ended up with. There was a buying frenzy, overwhelming the site, waits of I don’t remember how long when IE seemed to freeze. I wanted Forza because it’s not a shooter, and there weren’t many of those, but the Call of Duty was just what was available when my mouse click actually worked. It’s nice that Forza shows you how banged up your car is at the end, from hitting walls mostly, I didn’t catch up enough to hit other cars. I longed for a steering wheel. The cars were nice, but the goal of not hitting stuff was rough. Call of Duty: Ghosts was a surprise. I felt at home, literally. The scenery, the vegetation, even the houses of the opening sequence (after the story that probably connects somewhere beyond my reach in the game) were familiar San Diego suburban generic. Poway maybe, or Rancho Penasquitos, or possibly the fringes of my home city, Escondido. At first I wondered if there were versions based in different places, to make more users feel at home, and then I wondered if the locale was actually real, not generic, and if so where it was actually set. I liked that, but I had trouble walking with the controller, getting up and running straight, jumping, evading cars fleeing down the Poway-like street. Again I could have used a steering wheel. I didn’t get to a point where I got to shoot. I spent a couple of weekends before my grandson’s birthday trying to bond with the Xbox, then packed it up and sent it on. Even including the Kinect. I hear he likes it. Setting up the Raspberry Pi was another adventure. The hell of Linux, or Oracle, or anything else that takes more configuration than sense. Posted in Life, Raspberry Pi, Xbox.